An exquisite golf front home!! Come live the Florida dream in this custom-built Dave Brewer home on the 13th fairway of the Heathrow Golf and Country Club. 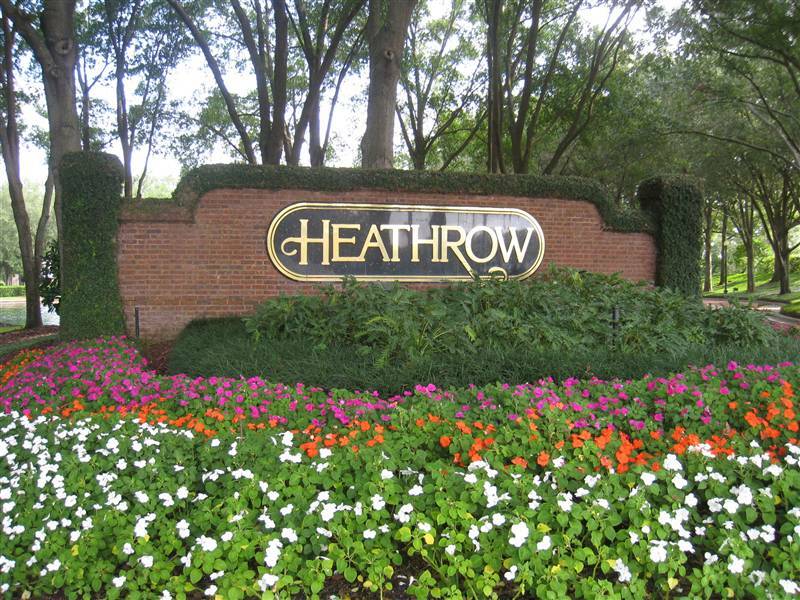 Heathrow is a premier gated community offering golf, tennis, swimming and much more located in Lake Mary, Florida. From the moment you enter the double leaded glass front doors it is undeniable this home was designed to take maximum advantage of the view! It 8217;s a virtual 180-degree view of lakes and the golf course from the plate glass windows and French doors that line the back side of the house. You may find yourself not minding being stuck in the kitchen as you can watch the ducks swimming in Island Lake, Sand Hill cranes grazing, or the golfers putting on hole 13. Whether you choose to linger in the master bedroom, the kitchen, family, dining or living room you can enjoy the view! This 4 bedroom 4 bath home has soaring ceilings throughout and generous closet space. Outside on the spacious screened in patio, there is an expansive covered area with a summer kitchen and bar. The large pool and spa have decorative tiles that coordinate with the beautiful stone decking. Whether you are a golfer or not this home and its view will surely not disappoint or last long. It is being offered fully furnished as shown with the custom window treatments, chandeliers, and furniture. Most furniture by Henredon, Bernhardt, and Broyhill. Be sure to view the virtual tour to get a peek at what this home has to offer. Heathrow Custom Pool Home on 1.45 Acres One of the Largest Lots inside the Gates of Heathrow! Very Private with a Main House and a Guest House! Main House has 4 bedrooms with the Master Suite Downstairs and 3 Bedrooms Upstairs with 3731 SF. The Guest House has 1 Bedroom Downstairs and a 2nd Bedroom Upstairs, Full Gourmet Kitchen, Loft Area, Great Room with 1647 SF. The open pool is between the 2 homes with paver decking. The grounds of this property are so well maintained and lush with upgraded landscaping allowing privacy and creating walkways throughout. Circular driveway and a 3 car side entry garage for plenty of parking space. Both homes were completely renovated/upgraded in 2007 to include Pella Windows, Travertine Flooring, Onyx and Granite Countertops, New Lighting, Plantation Shutters, Gourmet Kitchens with Stainless Steel Appliances, New Cabinetry, New Fixtures, New Contemporary Wood Stairs. Tongue and Groove Vaulted Ceilings. Truly One of a Kind Estate in Heathrow. Guest House has it's own Gourmet Kitchen with 2 bedrooms, 2 baths, loft area, family room. Both homes are 2 story. Guest Home has a chair lift. Tile Roof. Walk ways created with pavers. Pool is fenced with wrought iron. These homes may be under audio and or video surveillance. Pre-Construction. To be built. Pre-Construction Arthur Rutenberg Home. This beautiful Mediterranean style home with an open floor plan features a chef's delight Kitchen with stainless steel appliances, 5 burner gas cooktop, large island, granite counter tops, custom cabinets with designer door hardware, upgraded glass backsplash, under cabinet lighting and porcelain tile floors. The Master Bath features crown molding, hardwood vanity cabinets, granite vanity tops with china undermount bowls, a Soaker Bathtub and walk in shower. This delightful open floor plan offers many, many custom features including porcelain tile floors in Foyer, Gallery, Kitchen, Family Dining, Great Room, Utility Room, wood floors in the Den/Office, granite countertops with undermount china bowls in all baths and crown molding in all living areas. The energy appointments include open cell foam insulation, LED lights, Low E insulated glass in all windows and sliding glass doors, Injection Foam in block walls, 15 Seer high efficiency heat pump. ACUERA, Luxury at its finest! This 4 bedroom, 3.5 bath prestigious home with 3 car garage is nestled in a tranquil and natural setting in Lake Mary. Bring your love of nature and your canoe or kayak. Enjoy the beautiful trail to the Wekiva River and all that nature offers. Acuera is a gated community with only 35 homes. This upscale community is centrally located to major roads, parks, trails, shopping, schools and more! When only the finest will do! Virtually no amenity is lacking in this spacious Mediterranean style home. Impeccable in every detail. This disctintive and elegant home offers the good life at a good price. Features of this Stunning executive home include: 13; Split plan, den/home office, separate formal dining, gourmet kitchen, open concept floor plan, spacious master suite with his and her baths, large laundry room, 3 car garage, paver driveway, fenced in yard, tile roof, and so many more upgrades to enjoy. Expect to be impressed with the extensive appointments of this luxury home. Beautiful Custom Home now owned by Lender. This is a med styled home in desirable 31 home gated community near Heathrow called Island Club in beautiful Seminole County. Constructed in 2007, this home features 4 Bedrooms and 4 1/2 Baths in 4009 sf of living area on two floors. The home directly fronts and has views of Banana Lake. There is a three car garage broken into a double car garage on one side of the home and a single car garage on the other side of the home; both are front loading. A pool and spa with small summer kitchen are featured on the patio which you access from the living room in a three panel pocketing slider for wide open living. Spacious kitchen with huge island and formal dining room with a large living room area that has a gas fireplace. The home also features a residential elevator to easily access both floors. Upstairs there is a large master bedroom overlooking the lake and a large master bathroom with dual closets. Three additional large bedrooms upstairs, each with their own bath, and an upstairs open living area with cable connections round out the inside features upstairs. Downstairs, there a small wine cellar room off the downstairs living room. Renovation completed, new paint, appliances, carpet and landscaping. Home is ready for its new owners. JUST REDUCED $25,000! STUNNING UPDATED Custom-built home in 24 hour guard gated golf community of Heathrow. This home has been completely remodeled with Italian porcelain tile throughout and dark bamboo flooring in all the bedrooms. Additional updates include: sky lights, all bathrooms, light fixtures, knockdown ceilings, crown molding, interior and exterior paint, HVAC systems, gourmet kitchen and more. This home is in MOVE-IN CONDITION & PRICED RIGHT! The spacious MASTER SUITE has private access to the pool and screened patio area, modern fireplace, plantation shutters and 3 walk-in closets. The other bedrooms are all generously sized. The upstairs BONUS ROOM with full bathroom makes a perfect game room or theater room. Enjoy Florida living at its best with a breathtaking & private swimming pool area. The amenities that Heathrow offers are incomparable in the Orlando area with a Championship golf course, Clubhouse with a grill room, locker rooms, pro shop, formal dining room & a convention & wedding facility, racquet club, fitness facility, Olympic-size pool & children's pool & recreation facility offering lighted basketball court, soccer field, baseball field, outdoor pavillion, & fishing pier. Completely Renovated Heathrow Pool Home with 4 Bedrooms and 4 Baths, Bonus Room, and 3 Car Garage. All renovations completed from 2016 to 2019 to include: New Travertine Flooring, New Porcelain Tile Flooring, New Carpet in Bedrooms, New Paint Interior and Exterior, New AC, Pool and Patio Resurfaced and Paver Decking Added, All 4 Bathrooms completely updated flooring, sinks, hardware, lighting, glass enclosure, free standing tub in Master, New Water Heater, Patio Pavers Extended to create an outside sitting area, Fenced Yard, Plantation Shutters, New Washer and Dryer, New Stainless Steel Appliances, New Kitchen Hardware and Cabinetry Updated, All New Light Fixtures and Fans, Molding in Living Room Added Wainescoting, Woodburning Fireplace in Family Room Added New Stone Refaced, New Upgraded Landscaping, New Hardware on Garage Doors. Split Bedroom Plan. Open Area Between the Secondary Bedrooms could be play area or office. Termite Bond with Massey is transferable. This home may be under video and or audio surveillance. Beautifully updated estate home in the premier community of Heathrow priced $20,000 under recent appraisal. Impressive from the moment you arrive. Elevated property w/circular drive, stone front and 8 ft. mahogany, leaded glass front doors. Separate formal living/dining spaces. Notice the beautiful architectural elements- ornate ceilings, transom windows, and crown molding, and gorgeous hardwood flooring. Gourmet kitchen with WOW factor: Viking, Bosch & Samsung appliances, granite counters, updated cabinetry, & oversized eat-in space w/pool view. Kitchen is open to family room which has an attractive stone front gas fireplace. Huge master suite on one side of home-ideal for privacy. Bedroom large enough for sitting area, and it has a large picture window w/pool view. Stunning remodeled master bath w/jetted tub, beautifully tiled shower and expansive dual sink vanity. You 8217;ll also love the custom designed master closet! Beautifully designed bedroom suite added off the family room 8211;includes bonus/sitting room w/pool view. One reason you 8217;ll want to own this home is all that you have out back. Pristine salt water pool w/spa, built-in grill, attractive paver patio that can be accessed from numerous points around the home and pool bath. Updated pool tile & Pebbletec lifetime pool surface. Other notable features: audio system, silhouette shades on most windows, new 5 ton A/C, new pool pump and laundry room w/added cabinetry/shelving. You 8217;ll love living here-come see all that this special home has to offer! FULLY FURNISHED or UNFURNISHED...you choose! Beautiful home in the beautiful golf community of HEATHROW! This amazing home is located on a quiet tree lined street and has the ultimate floor plan for entertaining! As you arrive to the home you will notice the circular paver driveway and lush landscape. Guests will enter through a covered entryway to the grand foyer with vaulted ceiling and Imperial staircase. The home features lots of larger windows to allow this home to be flooded with natural light. To the right you will find the cozy living room with a wood burning fireplace, siting area with wet bar and adjoining sun room overlooking the pool and patio area. The large formal dining room with tray ceiling will be on the left side of the home. The eat-in kitchen is complete with a breakfast bar, GRANITE counter tops, STAINLESS STEEL appliances, double ovens and wine rack. A circular staircase takes you to the third floor GAME ROOM! The private master suite offers a gorgeous tongue and groove ceiling, seating area, large walk-in closet, an en-suite bath with dual sink vanity, soaking tub and walk-in shower. The second-floor loft area offers a wet bar and wood-burning fireplace. This area could be utilized as an office space or kids play area. Outside you will find a large pool and wood deck leading to the HOT TUB. There is also a large adjoining guest house with a bedroom and full bath. Additional features of this home include a 4-car garage, gazebo, inside utility room and BRAND NEW $100k ROOF.